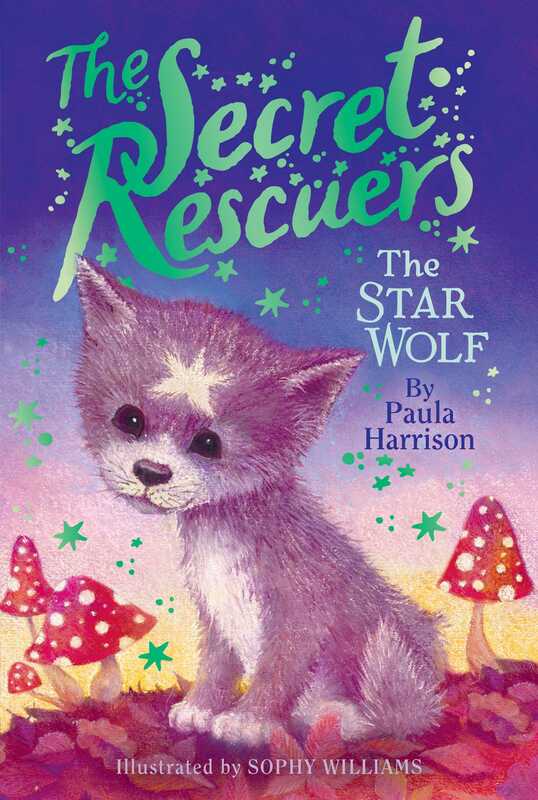 Emma rescues a baby star wolf who was caught in a trap in this fifth book in the adorable Secret Rescuers series. Emma lives in a forest full of magical creatures like star wolves! The wolves’ special song makes the stars appear in the sky every night. When Emma rescues a baby star wolf from a trap, she knows she must return the pup to his family. Can she be brave enough to go on a night-time adventure and help to keep the stars shining? Emma stepped out of the front door of her treetop house and breathed in the fresh forest air. The leaves on the branches glowed green and gold in the sunshine. A squirrel darted along a nearby branch with a nut in its paws. Emma smiled as she watched the little animal scamper to the ground and start burying the nut in the earth. A cold breeze ruffled her light-brown hair. She picked up her wicker basket and drew her dark-blue cloak tightly around her. Holding on to the rail, she crossed a little bridge made from rope and wooden planks. Far below, the floor of the forest was decorated with the first fallen leaves of autumn. Emma loved walking through Tangleberry Rise. The whole village was made from wooden tree houses connected by little bridges. Her mom and dad ran a market stall in the middle of the village selling bread, cakes, and pies. Emma liked helping with the stall, although she sometimes felt a little shy in front of all the customers. What she loved most of all was cooking delicious pies and cakes ready for the market. This morning she was going to gather jem berries to make some lovely pies. At sunset the Lantern Festival would begin. There would be music and dancing and games. Lots of people would want cakes and pies to eat! Emma skipped across the last bridge and climbed down a little wooden ladder to reach the ground, before following the main path out of the village. Out here, she could hear the sounds of the Whispering Forest more clearly: the squeaks of the mice, the drumming of deer hooves, and the hammering of emerald woodpeckers in the trees. Beneath it all was the whispering of the wind in the leaves that gave the forest its name. Sometimes, if she was really lucky, Emma heard a golden songbird singing in the treetops. But the most amazing sound of all happened at nightfall, when the star wolves sang. There were lots of magical animals in the Kingdom of Arramia, like storm dragons, unicorns, firebirds, and cloud bears. The best-known magical creatures of the Whispering Forest were the star wolves. Hardly anyone had seen them up close, because they were shy animals and lived in the deepest, wildest part of the woods. Emma had only watched them in the distance, slipping in and out of the trees like silver-gray shadows. Each night their beautiful song drifted over the treetops and lulled her to sleep. Her mom had once explained how their music brought out the evening stars. Without them the night sky would be dark with no starlight at all. Skipping through the trees, Emma stopped here and there to pick the wild berries that grew by the side of the path. She was heading for the thickest part of the woods, where the red jem berries grew. She found a few strawberries and ate them. They tasted deliciously sweet. There was so much fruit growing here. She knew she’d find plenty to fill up her basket! She came to a clearing filled with meadow flowers and sat down underneath a huge red-and-white toadstool. Two planets hung together in the sky, one purple and the other green. Giant silverwing butterflies grazed on the flowers, and the chirping of the forest birds filled the air. Emma started thinking about the Lantern Festival. She looked forward to it every year. There would be apple bobbing and games like pin the tail on the star wolf. A big bonfire would be lit in the clearing in the middle of the village and a band would play so that everyone could dance. Emma hurried on, reminding herself that she needed to gather plenty of fruit for the pies. A little farther on she found the thicket of birch trees she was looking for. Jem berry bushes grew all around this part of the woods. Her fingers grew sticky as she picked the berries and put them in her basket. A little mouse scampered out of its hole in the root of a tree and gazed at her, whiskers twitching. “Here you are!” Emma placed a jem berry on the ground and smiled as the little animal gathered the fruit and scurried back into its hole. She was about to walk on when she heard a funny sound. It was a squeaky animal noise, but it was too loud to be a mouse or a rabbit. The squeaky sound came again. It went on for a few seconds and then broke off with a sob, as if the animal was crying. Emma hooked her basket over her arm and pushed her way past some low branches. In the middle of a group of trees was a wooden box buried in a hollow and half covered by earth and leaves. There were thin spaces between the wooden slats and something was moving inside. As she stepped over a fallen branch, another box snapped shut right next to Emma’s foot. She hopped out of the way, her heart thumping. The box had only missed her toes by a whisker! Stepping more carefully, she crouched down by the first box and looked inside. A little star wolf with sad black eyes gazed back at her. A terrible thought popped into her head. Was this an accident or had someone left a trap for the poor animal? Had the box snapped shut on the poor star wolf, just as the other one had almost trapped her foot? The small star wolf let out a long whimper and scratched against the inside of the box. The creature stopped scratching and howled sadly. The little wolf gulped down the berry and then sniffed Emma’s fingers as if hoping for more. “Now, there must be a way to get you out.” Emma put down her basket and knelt beside the box. She pulled at the lid, but it wouldn’t open. At last she found a catch in one corner and tugged at it. The catch sprang open. With a bark of delight, the little wolf jumped out of the box and right into Emma’s arms. The little wolf barked again and licked her cheek. Emma ruffled his ears. He was so cute, with deep black eyes and a thick silvery coat. The pup sat on his haunches and licked the small pink pads in the middle of his paws. Emma was about to take another look at the wooden box when she heard voices. Her mind whirled. What if the box belonged to these people? What if they were angry that she’d opened it? Quickly, Emma picked up the wolf pup and her basket and hid on the other side of the thicket. A man and a woman dressed in smart brown uniforms came through the trees and stopped next to the boxes. “That shows you know nothing!” snapped the man. “We did catch something. Look, this one’s been opened from the outside.” He pointed to the box Emma had undone. Emma’s heart sank and she clasped the wolf pup tighter. She was right. These people had set the traps on purpose. Someone had told them to do it—someone who wanted to catch magical animals. Well, they couldn’t have this little star wolf. She was going to get him to safety as fast as she could! "A great new series to add anywhere magical animal series are popular, and perfect for readers making their way into longer chapter books."